More than eight million people have been born from IVF since it was first used 40 years ago, according to research. Louise Brown, the world's first test tube baby, was born on July 25 1978 at Oldham General Hospital in Greater Manchester. Since then millions more families around the world have used IVF – in which a woman's egg is fertilised in a lab instead of inside her body – to conceive children. It is used as a method of conceiving for couples when the man or woman is infertile. An estimated half a million babies are now born from IVF every year worldwide, and Spain and Russia have the highest rates of IVF in Europe. About 36 per cent of women in Europe who have IVF or similar treatment fall pregnant, and around 14 per cent of those have twins. In vitro fertilisation, in which a woman's egg is removed from her ovary and fertilised with a sperm in a lab, may be available on the NHS or can be paid for privately. Another advanced fertility treatment is intracytoplasmic sperm injection (ICSI), in which a sperm is injected directly into the egg, whereas in IVF they are mixed together. Louise Brown's in vitro conception was led by the Cambridge reproductive biologist Robert Edwards, a later founder of the European Society of Human Reproduction and Embryology (ESHRE). Now, 40 years on, an international committee reports the global total of babies born as a result of IVF and other advanced fertility treatments is 'more than eight million'. Studies from data collected between 1991 and 2014, represents a steep rise in the use of IVF in the treatment of infertility. 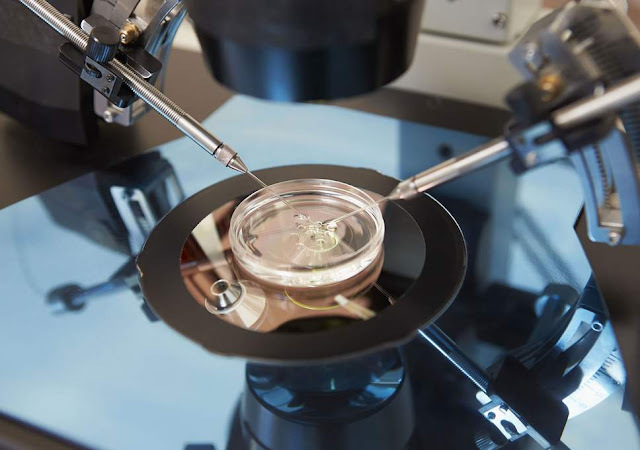 Estimates are that more than a half million babies are now born each year from IVF and ICSI – known together as assisted reproductive technology (ART) – and more than two million treatment cycles are attempted. It was announced at a congress in Spain by the International Committee for Monitoring ART. Dr David Adamson said: 'Based on [the] annual collection of global IVF data, it is estimated that since Louise Brown's birth in 1978 over eight million babies have been born from IVF around the world.' Europe, Spain remains the most active country in assisted reproduction. The European Society of Human Reproduction and Embryology (ESHRE) has found that a record 119,875 treatment cycles were performed in Spain in 2015. Second in Europe are Russia (110,723 cycles), followed by Germany (96,512) and former front runner France (93,918). The cycles monitored by ESHRE include treatments with IVF, ICSI, and egg donation. The report covers a total of almost 800,000 treatment cycles performed in Europe in 2015, from which 157,449 babies were born.